Piano Concerto No. 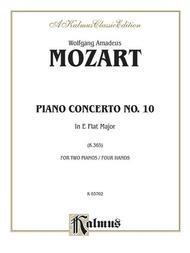 10 in E-Flat Major for Two Pianos, K. 365 composed by Wolfgang Amadeus Mozart (1756-1791). For Piano. This edition: 2 copies required. Duet or Duo; Masterworks; Piano Duo (2 Pianos, 4 Hands). Kalmus Edition. Form: Concerto. Classical; Masterwork. Advanced. Book. 52 pages. Published by Kalmus Classic Edition (AP.K03702).ISBN 0769241468. Classical; Masterwork.